Kyzer II ~~ The YO Ranch is the Texas Longhorn comeback show place. 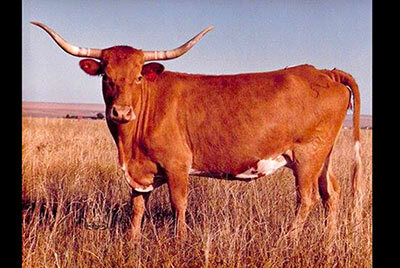 In the early sixties Charles Schreiner III bought a foundation herd of Texas Longhorn cattle from Graves Peeler and then blended Yates and WR blood into the Peelers. The first TLBAA cow and bull registered were YO cattle as Charles III was president of TLBAA. In the mid seventies the YO hosted some barn burner TL sales. Possibly the highest average was in 1980, which was above the $5000 mark. The YO was an over 50,000 acre hill country desert brush ranch. Rocks, cactus and white tail deer abound. To attend the annual TL sale it is a 45 minute drive from Kerrville, Texas, about 100 miles west of San Antonio. People stay at Kerrville motels and do the rocky ranch road drive to the heart of nowhere, the YO. At the May 1980 sale the TL industry was at an all time optimistic high. Any TL registered critter was worth $3000 and the world was full of people who wanted to start a herd. This was the period of time I was hunting the superior genetics for our growing embryo program in Colorado. I had been hunting a strong Yates blood cow for flushing and they were hard to find that were really good. Kyzer II was consigned by famous Dallas Judge Suggs, and in that day was outstanding. She wasn't a Doherty 698, but nearly as much horn and a smooth good sized cow with a pretty face. I planned on buying her. There were several deep pocket people who were friends of Red McCombs. He advised them all to buy TL cattle. L. D. Lloyd Brinkman who had earned a Texas train-load-fortune with BrinkCraft carpets was there to start a herd plus many more in the same financially blessed condition. Now, draw this picture: The YO is in the Texas Hill Country desert. It is dry and dusty 360 days of the year. A jack rabbit has to pack a canteen to hop across the YO. Big cars, duly trucks and long trailers were everywhere, yet one open parking spot remained not far from the serving line, which was a no parking area. Some of these sales, in that day, would have several guests just drop in by helicopter making a very impressive entry. And here came one -- John Roberts dropped out of the sky and landed on this open area -- it was impressive, except, the wind current from the craft blew a cloud of YO parking lot dirt over everything 100 feet in all directions totally covering up thousands of dollars in freshly displayed catered vittles. As 400 people saw John step out of the chopper with a smile and a white starched shirt -- then look over at the barbecue covered in various blends of particles, you never saw a crowd get madder faster. Had it not been for some culture and civilized control, they would have hung John Roberts by the heels right there and then. The food was covered with dirt. It was a 45 minute drive back to clean food and restaurants at Kerrville, the sale was ready to start in less than an hour. Well, as Longhorn people do, they went to plan two. They scrapped the dirt off the chow, dug under the layers and at least the front 100 people ate with not much "stuff" on it. Yet, the last people got more of a food/dirt blend and more of a crunchy sound to the beef brisket. That day, like no other day I can recall, Longhorn people ate a world of dirt. The sale started a little late. I sat by Mr. Brinkman. I wanted to buy Kyzer II. Stupid me, I told him my plan and how well I liked this cow. When Kyzer II came in, I bid a few times and to my chagrin, Mr. Brinkman bid against me. I couldn't believe it. I bid again and someone bid against us both -- it was Roberts. When those two were fighting it out I just gave up and watched the show. She brought $8600. A few months later I was able to negotiate an embryo partnership. We took her to our ET lab in Colorado and John Roberts got half the Kyzer II embryos and we got half. We flushed her to Texas Ranger and Classic which were the two high dollar bulls of that day. Although she was very fertile and produced over 40 calves in a short time I don't know where they all went. International Champion Lethal Weapon was a great grandson of Kyzer II. El Coyote got Tri-W Broken Arrow, her son. Red McCombs got one embryo and registered her as Miss RM-8/T. She was purchased by George Wilhite and became one of the few cows bred by Right Hand Man before he was stuck by lightning. She produced the grand dam of the great Rio Grande.